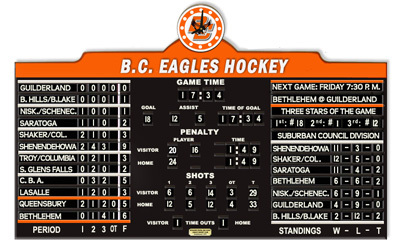 Hockey Scoreboards (Customized, Vintage-style, Wooden, Hand-operated) – Premier Hockey Merchandise - Hands-on Fun For The Passionate Hockey Fan! Customized with your team's name and colors on the top panel and your team's logo on the clock face! Sensational fund-raising idea! Terrific prize to raffle after displaying all season! Promotes your team, resulting in heightened community awareness and increased attendance - meaning more ticket and concession sales for your program! We can customize tiles with player names, showcasing individual student-athlete achievement! Loaded with value! Includes approximately 300 numerical tiles! Keep score of all the action, including conference standings (comes with 24 tiles customized with the team names in your conference)! You'll also get all 30 NHL city team tiles for keeping score of NHL games! Comes with a durable, portable container for storing tiles conveniently and a handsome inscribed nameplate customized with your choice of wording! Earn revenue by accepting advertising from sponsors! We can attach a panel displaying the name(s) and/or logo(s) of your local business sponsor(s) to the bottom of the scoreboard! Ideal for any level of hockey competition - boy's or girl's Select Competetive or House League youth hockey (Mite, Tyke, Novice, Atom, Squirt, Pee Wee, Bantam, Midget), men's or women's amateur hockey (high school, prep school, Major Junior, Minor Junior, college), recreational hockey (intramural, club, adult leagues), minor league, semipro, professional, fantasy leagues, street hockey, in-line hockey and more! The ultimate Birthday, Christmas, Hanukkah, Valentine’s Day, Wedding Anniversary, Retirement, Father’s Day, Mother’s Day, Bar/Bat Mitzvah or Graduation gift for the passionate hockey fan, player or coach in your life! The perfect décor for bars, restaurants, sports bars, sports card/memorabilia shops and sporting goods stores with a hockey fan clientele! Comes with a functional clock! Just the right size – measures approximately 35 inches high by 56 inches long (approximately 3 feet by 4 ½ feet), ½ inch wide (thick), weighs approximately 20 pounds. Large enough for scores to be seen easily at a distance, yet small enough to fit into most prospective display areas. (Dramatic, yet practical). Be creative! Keep score of MLB, NFL and NBA action in the off-season!